If you have a puppy or kitten living in your home, then removing pet stains from carpet may be a task you are all too familiar with. Fortunately, there are ways to continue house training your pet without permanently damaging your floors. Accidents happen when you have pets around. Regardless of what triggers the mess, the key is to clean it up as quickly as possible, so it doesn't permanently stain your carpet. Mix a solution of half white vinegar and half warm water. Apply the cleaning solution to the stained carpet. Work the mixture into the carpet with a scrubbing brush. Blot the area with fresh cotton rags or several layers of paper towels. Vacuum the area to remove excess moisture. Apply a liberal amount of baking soda to the damp carpet. With the baking soda site, mix half a cup of three-percent hydrogen peroxide with a teaspoon of liquid dishwashing detergent. Slowly pour the hydrogen peroxide and detergent solution over the baking soda. Gently mix the wet solution and the dry baking soda and scrub it into the carpet with a brush. Allow the area to dry completely, and then vacuum it up. Depending on the size of the stain you may want to use a wet/dry vacuum to remove excess moisture from the carpet prior to applying the baking soda/hydrogen peroxide mix. Treat the stain with a commercial carpet cleaner, such as Spot Shot Carpet Stain Remover, Stain-X Carpet Stain Remover. Another option is to apply a heavy-duty laundry stain remover, such as OxiClean Max Force Laundry Stain Remover to the carpet stain. Allow the stain remover to penetrate the feces mark, and then scrub it with a cloth or scrub brush soaked in warm soapy water. Repeat spraying the stain with the commercial product and scrubbing it with the cloth or brush until the feces is no longer visible. Use fresh cotton cloth or several layers of paper towels to absorb as much of the moisture as possible. Repeat with fresh towels until the carpet is dry. Mix one cup of white vinegar with a cup of warm water and spray or pour it over the stain. You may need to make more of the cleaning solution if the stain is large. Use dry cloths or paper towels to absorb excess moisture. Sprinkle the area with a generous amount of baking soda and allow to sit overnight. In the morning vacuum up the remaining baking soda. 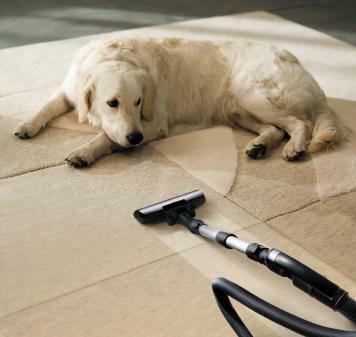 When it comes to removing pet feces stains from carpets, avoid using steam cleaners, as the heat can permanently set the stain and the odor by adhering the protein to the carpet's man-made fibers. When removing pet stains from carpet, do not reach for ammonia or ammonia-based products. This is especially important to remember if you are trying to remove dog pee from your flooring. One of the ingredients in dog urine is ammonia and if you use a cleaner with the product your pooch may be encouraged to re-offend in the same area when it detects the smell of ammonia. Since many household carpet cleaners contain ammonia, it's important to read the labels carefully before using them to treat pet stains. Finally, it is important not to get discouraged by your pet's accidents. Once you have successfully cleaned the pee or poop stains from your carpets, reiterate to your pet where he should be relieving himself. Also, make the accident zone as unattractive as possible while redirecting your pet to the appropriate potty area. Litter box training dogs and cats takes time and patience, but it is not that hard, especially if you consult a trainer to help you with the process. Another option is to get tips from virtual pet trainers who offer online services to cat and dog owners struggling to get Fido to cooperate with house training.